And we’re back! So far we’ve gone through the Quarterbacks, Running Backs and Wide Receivers, so now we’re up to the Tight End rankings for 2014. As you probably guessed the Tight End group is essentially Jimmy Graham and everyone else, but there are quite a few talented tight ends that could make the leap. Although I don’t see any Graham type breakouts from this group, there are quite a few potential breakouts that can be had late in drafts. So without further ado, let’s get right to this year’s rankings. Who Are The Top Tight Ends for 2014? 1. 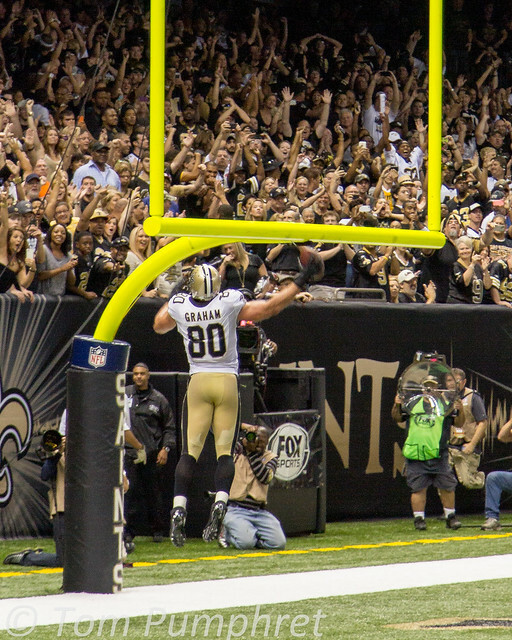 Jimmy Graham, New Orleans Saints – When it comes to tight ends, there’s Jimmy Graham and there is everyone else. Graham’s 300+ fantasy points last season ranked him right along side names like Calvin Johnson and LeSean McCoy, and at such an extremely thin position, he gives you a major advantage over everyone else in your league. Unfortunately for all of us the Saints decided to play franchise tag games with Graham, and he wants wide receiver money. An arbitrator ruled that he should be classified as a tight end, but that doesn’t mean Graham will sign the franchise tag contract so we may be looking at a holdout. Update! Graham has signed a 4 year, $40 million contract to remain with the Saints so a possible holdout is no longer an issue. Graham is head and shoulders above every other tight end and is worthy of a mid first round pick. 2. Julius Thomas, Denver Broncos – Orange Julius is a mismatch nightmare, who has an elite size and speed combination that cause a lot of problems for defenders. When you add to that the fact that Peyton Manning is throwing him the ball, big things can happen and they did all last season to the tune of 788 yards and 12 scores. While the Broncos brought in Emmanuel Sanders as a replacement for receiver Eric Decker, I expect a lot of Decker’s production to go to Thomas in 2014, especially in the red zone. If that happens Thomas has a very good chance to lead the league in receiving touchdowns, and could be fantasy’s top tight end if Graham holds out. 3. Rob Gronkowski, New England Patriots – On a per game basis Gronkowski was every bit as good as Graham, if not better, but once again Gronk starts the season recovering from yet another injury, this time a torn ACL and MCL. Gronk is said to be ahead of schedule at this point, but even if he’s on the field we’ve seen players perform poorly coming off the same injury (think Robert Griffin III and Wes Welker). When he’s health Gronk is an elite tight end, but drafting him early comes with an awful lot of risk again this year. 4. Jordan Cameron, Cleveland Browns – Cameron had the breakout season that many fantasy owners had long been expecting last season posting 80 catches, 917 yards and 7 touchdowns despite the Browns playing quarterback roulette most of the year. The loss of Norv Turner (known for his use of tight ends in his play calling) may hurt Cameron’s numbers a bit, but he’ll have a big upgrade at quarterback in Johnny Manziel that should offset some of the loss. Although I wouldn’t expect Cameron to take another step forward this season, he’s should be a solid TE1 and worthy of being one of the top tight ends selected on draft day. 5. Vernon Davis, San Francisco 49ers – The knock on Davis coming in to 2013 was that he was great between the 20’s but didn’t score enough touchdowns. Davis answered his critics by tying his career high in touchdowns (13), largely benefitting from the absence of Michael Crabtree and teams loading up on the run game. In 2014 the 49ers have reloaded on offense with the addition of Stevie Johnson to a healthy Crabtree and Anquan Boldin so there are a lot of mouths to feed, and a repeat of Davis’ numbers appears unlikely. Davis is also mired in a contract dispute with the 49ers so, like Graham, a holdout for Davis is also a real possibility and the 49ers tend to play hardball with holdouts so it could be a long one. If you have an early draft I would probably take a safer option until things get settled. 6. Jason Witten, Dallas Cowboys – It was a down season for Jason Witten, unexpectedly posting his worst receptions and yardage totals since 2006. What’s more concerning is his lack of week-to-week consistency. Witten failed to top 50 yards in 9 games last season, including twice in the fantasy playoffs. This year Dallas will be forced to throw a lot, and although I’m not expecting a career year at age 32, I would expect to see a bounce back in Witten’s production in 2014. Draft him as a TE1 in your drafts, but older tight ends drop off quickly so I wouldn’t pay a premium for his name. 7. Greg Olsen, Carolina Panthers – Nobody is going to be excited to draft Greg Olsen, but since joining the Panthers he’s been one of their best offensive weapons, and has posted back to back 800 yard seasons, finishing in the top eight in receptions, yards and touchdowns amongst tight ends. After losing their top 3 wide receivers this off-season, Cam Newton will rely more on Olsen than ever and he’s a good bet to repeat if not exceed his career highs in 2014. 8. Dennis Pitta, Baltimore Ravens – A top five ranked TE coming in to 2013, Pitta dislocated and fractured his hip in training camp and missed most of the season before returning in week 14. When healthy, Pitta is a vital cog in the Ravens offense and Joe Flacco’s favorite target. After he returned he was targeted 33 times over the final 4 games of the season… a pace that would have him second only to Jimmy Graham. If Pitta is fully healthy for the entire season he should be a solid, reliable tight end for fantasy owners and has top 5 TE upside if he continues to be heavily targeted. 9. Kyle Rudolph, Minnesota Vikings – Last year Rudolph’s production was nothing special, posting just 313 yards and 3 touchdowns in eight games before a foot injury ended his season. Coming in to 2014 there are a few things working in his favor. First, the Vikings brought in Norv Turner as their offensive coordinator. As mentioned in the Jordan Cameron blurb, Norv’s system heavily targets the tight end, leading to huge years from players like Antonio Gates, Jay Novacek and most recently Cameron. While Rudolph isn’t as athletic as those three, he’s no slouch and has a bigger frame than all of them which could make him a bigger red zone threat. The Vikings also upgraded their quarterback situation with rookie Teddy Bridgewater, and everyone knows rookie QB’s love the ‘safety valve’ tight end. Rudolph isn’t going to take a leap in to the top tier of tight ends, but his situational upside makes him worthy of being one of the top 10 TE’s drafted. 10. Martellus Bennett, Chicago Bears – Another under-appreciated tight end, Bennett started the year on an 82 reception, 930 yard, 8 touchdown pace before a week 6 knee injury slowed him. With teams focused on Brandon Marshall, Alshon Jeffery and Matt Forte, Bennett is a good bet to post career highs in just about every category. A reliable TE1 who can be had in the mid 12th round in most drafts, Bennett is a great value for those who like to load up elsewhere before drafting a tight end. 11. Ladarius Green, San Diego Chargers – Out of all of last year’s breakout TE’s, Green is by far my favorite and I might have ranked him higher if not for the presence of Antonio Gates. At 6’6″ 240lbs with 4.5 speed, Green is an explosive athlete with good hands, and plays in an offense that isn’t afraid to put the ball in the air. Green will likely have a few down weeks when Gates is more involved in the offense, but he should emerge as the Chargers top tight end by the end of the year and if everything breaks right could jump to the elite tier. Buy! Buy! Buy! 12. Zach Ertz, Philadelphia Eagles – Ertz’s 2013 numbers (36 rec, 469 yards, 4 TD) don’t jump out at you as anything special but by the end of the season it was clear that he was becoming a bigger factor in the Eagles offense over the second half, highlighted by week 13’s 2 touchdown game against Arizona. Ertz is a good athlete with a big frame and is a precise route runner, which make him a good fit for Chip Kelly’s scheme. As you should know by now, I want as many pieces of the Eagles offense as I can get this season. With his talent and situation, he could be one of the biggest breakouts at tight end in 2014. 13. Charles Clay, Miami Dolphins – Drafted in almost zero fantasy leagues coming in to 2013, Charles Clay was one of fantasy’s top breakout tight ends posting 69 receptions for 759 yards and 7 total touchdowns…. Ranking him seventh in PPR leagues. The hybrid fullback / tight end should continue to be one of Ryan Tannehill’s favorite targets and might see a few goal line carries in the process. With the Dolphins moving to an up tempo style of offense – one that heavily involves tight ends – it’s possible Clay’s targets actually increase this season and he could come as a good value this season. 14. Jordan Reed, Washington Redskins – While many fantasy owners have Reed high in their rankings (he’s being drafted as the #6 tight end currently) he tops my list of tight ends to avoid in 2014. Although his stats look impressive, the bulk of his production happened over two big weeks, in shootouts against the Bears and Broncos but more importantly Reed suffered two concussions last season, and they appear to be an issue with him dating back to his days in college. Recently, Reed admitted to hiding concussion symptoms last year, which is just playing with fire. Concussions are a serious threat to a player’s career, and just like with Wes Welker, I’m not taking chances on concussions this year. Although he is a good athlete with big upside, Reed presents way too much risk to draft over other safer tight end options. 15. Antonio Gates, San Diego Chargers – After a down 2012, Gates started strong in 2013 and was a top 4 TE through week 11, but nagging injuries and the emergence of Ladarius Green caused Gates to limp to the finish (literally), scoring less than 10 fantasy points over his last 5 games (excluding week 17). Once the clear number one TE in fantasy, foot injuries have made it hard for Gates to move like he used to, but he’s still a crafty veteran and Phillip Rivers trusts him. With an ADP in the mid 14th round Gates is certainly worth rostering, just don’t expect the production that the old Antonio Gates would have provided. 16. Tyler Eifert, Cincinnatti Bengals – A tall (6’6″) tight end with wide receiver skills, many expected a big season from Eifert, but rookie TE’s rarely succeed in their first year and Eifert was no different, finishing the year as the 26th best TE in fantasy. In 2014 the Bengals will be looking for a complement to AJ Green in their passing game and Eifert is more than capable of filling that role. Eifert is dealing with a shoulder injury in OTA’s or I would have ranked him higher. We’ll definitely keep an eye on the injury through the pre-season but if he’s healthy he has a lot of talent and is a good breakout candidate for 2014. 17. Heath Miller, Pittsburgh Steelers – Miller finished 2012 as a top 5 TE, thanks mostly to his 8 touchdowns, and a career highs 816 receiving yards, but a torn ACL abruptly ended his career year. Surprisingly, Miller missed just two games in 2013, but was clearly not the same player, scoring just one TD and finishing the year barely in the top 20 of fantasy tight ends. With another year of recovery for his knee, Miller should return to his usual self in 2014 and be expected to pick up some of the production left behind by Emmanuel Sanders. I wouldn’t expect another career year but Miller is a solid veteran, and with a 15th round ADP he’s a good value at the position. 18. Dwayne Allen, Indianapolis Colts – When the Colts drafted two tight ends back in 2012, many thought Stanford tight end Coby Fleener (Andrew Luck’s college roommate) would be the star but instead it was Allen who proved to be the more reliable target. Last season many had Allen ranked as a sleeper tight end to target, but a week 1 hip injury ended his season almost before it began. The Colts struggled to move the ball last season and Fleener did very little to capitalize in Allen’s absence. I don’t think Allen has top 5 upside, but it wouldn’t surprise me at all to see him become a mid to low end TE1 who can put up reliable numbers at a low draft day cost. If you’re looking for a young player with talent later in your draft, Allen is an excellent player to target. 19. Eric Ebron, Detroit Lions – Ebron is a physical freak – a poor man’s Vernon Davis – and he landed in one most pass happy offenses in the NFL. All signs point to a breakout for Ebron, but the hype may be getting a little too high with him because rookie Tight Ends rarely succeed in the first year. Still Ebron has all the tools to be a future star and Detroit needs complements to Calvin Johnson so a breakout will come at some point, I’m just betting it’s not in 2014. At this point I wouldn’t draft him as a starting tight end, but his upside makes him a great backup, especially if he falls late in drafts. 20. Garrett Graham, Houston Texans – Last season wasn’t a blowout year for Graham who finished with 545 yards and 5 touchdowns on 49 receptions, but there were signs of a breakout like his 7 reception, 136 yard, 1 touchdown game against Oakland in week 11. Graham has good size, speed and has reliable hands and most importantly Owen Daniels is no longer in Houston. New coach Bill O’Brien likes to use the tight end often and new quarterback Ryan Fitzpatrick targeted the tight end early and often last season in Tennessee. Graham is never going to be on the same tier of his namesake, but he could be a solid TE1 by year end.